Congrats to The Done Dept.’s Gold Medal Hurling Team. Every once in a while we sponsor stuff, and only once we’ve sponsored a sporting team. This happens to be a team in an up and coming Irish sports club, the STLGAC (Gaelic Athletic Club), for the sport of gaelic football. If you’re like we originally were, and have no idea what the heck gaelic football is, you can see a video of it being played HERE. It’s like basketball, soccer, and volleyball together. Anyway, believe it or not, the team we ended up sponsoring actually won the gold! That makes us one for one! All the teams we have sponsored are champions. Here is a team picture of The Done Dept. 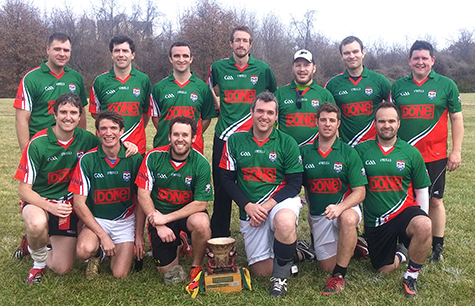 gaelic football champs of 2014.